Dorothy (McGahee) Braudy is an artist born in Los Angeles and raised in Kentucky. A graduate of the University of Kentucky, she received an M.F.A. from New York University and taught for many years at Pratt Institute, the University of Maryland, and Goucher College. Her work, which includes painting, photography, and printmaking, has been shown in New York, Washington, Baltimore, San Francisco, Los Angeles, and Italy and is included in many private and public collections. A career retrospective of her work was shown at the Ellen Kim Murphy Gallery in Bergamot Station in 2000. Her first one person show was at Viridian Gallery, when it was in Soho and called Second Story Spring Street. Other solo exhibitions include “Marking Time” (2005) and “Double Feature” (2007) at the Hamilton Galleries, Santa Monica, and in 2010 a one-person show at Northeastern University in Boston, as part of the conference “Art and Memory.”In 2014 she had a show with her artist son, David Fitzgerald, and her artist grandson, Travis Fitzgerald, “3 Generations”, in Manhattan. B.F.A., University of Kentucky (Art). M.F.A., New York University (Art Education). A.B.D., Teacher’s College, Columbia University (Art Education). Studied painting at the Art Students League 1964-68 with Marshall Glasier, Morris Kantor, and Theodore Stamos. Studied privately with Richard Pousette-Dart and Rudolf Baranik. Studied printmaking 1972-77 with Anthony Harrison at Columbia and William Maxwell at Teachers College. Assistant Professor of Visual Arts, Goucher College, 1978-83; Instructor, 1977-78. Instructor of Art, Towson State University, 1977. Assistant Professor of Art Education, School of Arts and Design, Pratt Institute, 1976-78; Instructor, 1972-76. Art teacher, various private and public schools in the New York/New Jersey area, 1964-72. 1991: 871 Fine Arts Gallery, San Francisco. 1988: Orlando Gallery, Sherman Oaks, California. 1986: Orlando Gallery, Sherman Oaks, California. 1985: Clark County Community College, Las Vegas, Nevada. 1984: Easton Academy of the Arts, Easton, Maryland. 1982: Mason County Museum, Maysville, Kentucky. Kraushaar Gallery, Goucher College, Baltimore. 1981: B.R.Kornblatt Gallery, Washington, D.C.
1978: Hogan & Hartson, Washington, D.C. (prints and drawings). 1977: Viridian Gallery, New York. 1976: Columbia University, Graduate School Gallery. 1975: Second Story Spring Street Society, Soho, New York. 2015: “3 Generations” Home Studios, New York, New York. 2011: “Looking In” Hamilton Galleries, Santa Monica, California. 2007: BAU Institute, Hudson, New York. Distinguished Faculty Invitational Show, Towson State University. 1984: Goucher College Centennial Show. 1982: Watercolor Show, Goucher College. 1981: Maryland Arts Council, “Intimate Interiors,” Goucher College. 1979: Baltimore Arts Festival, Maryland Institute of Science. 1977: Faculty Show, Pratt Institute Gallery. Baltimore Museum of Art, Sales and Rental Gallery. 1975: Pratt-Phoenix Gallery, New York. Women’s Interart Center, New York. Manhattan Community College, New York. 1974: Off-Broadway Gallery, New York. Nyack Art Gallery, Nyack, New York. Richard Ide Memorial Lecture Room, University of Southern California Jane Zimmerli Art Museum, Rutgers University, New Brunswick, New Jersey. Federal Reserve Bank, Richmond, Virginia. “Sacred L.A,” Journal of the American Academy of Religion, (Spring 2013). See, Carolyn, “Spanish stucco and common dreams,” Los Angeles Times, April 30, 2006. Gallagher, and Tom Lutz; poem by David St. John. “The Crossing,” Southern California Anthology, XIX (2003), Cover Image. “Dreamers of Decadence,” Women’s Studies, 32, 7(November 2003). Cover Image. “Finishing the Hat: Preface,” Women’s Studies, 32, 7(November 2003). “Parma behind the Scenes,” Theatre Journal, 55 (March 2003). Cover Image. Finishing the Hat: A Visual Memoir. Los Angeles: Lettra, 2000. With essays by Selma Holo, Francis Lerner, and Leo Braudy; poems by David St. John, Molly Bendall, Carol Muske, and Brenda Hillman. “Dorothy Braudy: An Interview, director Dorothy Lyman, videotape, 2000. “Dorothy Braudy, A Portfolio: Dreams of Broken Light,” Dreamworks, 1988. Selma Holo, “Finishing the Hat: Dorothy Braudy’s Artistic Journey,” Women’s Studies, 32, 7(November 2003). Clara Sturak, “She Made a Hat Where There Never Was a Hat,” Santa Monica Mirror, October 4-10, 2000. Sanda Agalidi, “‘Take 2’ at California Agro-American Museum and USC,” Art Week. January 1995.
Review. Los Angeles Times, December 9, 1988. “Dorothy Braudy,” ArtScene, December 1988 (Molly Barnes). “Dreams of Broken Light,” Dreamworks, 1988.
Review. Los Angeles Times, November 14, 1986. “Dorothy McGahee celebrates summer in Goucher exhibit, Baltimore Sun, September 9, 1982 (Steve Purchase). “Dorothy McGahee: The Pool Paintings,” New Art Examiner, October 1981 (Judith Cox). 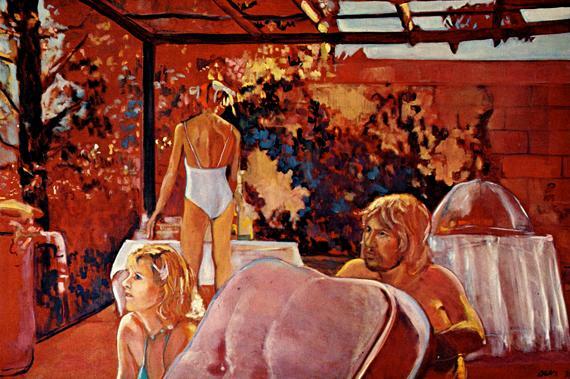 “Swimmers, Sunbathers, and Showoffs are Caught in McGahee’s Pool Paintings,” Baltimore Sun, September 17, 1981 (J. Wynn Rousuck). “Private Spaces,” New York Journal of the Arts, September-October 1978 (Holland Cotter). Review, Arts Magazine, October 1978 (Margaret Pomfret). Review, Arts Magazine, April .1977 (Margaret Pomfret). Lectures on American Art since World War II in Beijing, Xian, Loyang, Shanghai, People’s Republic of China, May 1990. “From Student to Professional: The Problem of Transition in an Artistic Career,” San Diego Community College, April 1988. Student Art Show Judge, Chapman College, May 1988. Guest Artist, Molly Barnes’s Art Talk, KPFK, April 1988.